A while back, I wrote an article about House Bolton and flaying in the Middle Ages. Here are a few tidbits I’ve learned since then that I thought I’d share with you – these ones are a little less gruesome. Warning: This article contains violent images. House Bolton’s banner. Image: (c) HBO promotional images. While the mercenary gangs are often neglected in history books, they did enormous harm to the French people during periods of peace. Kings signed peace treaties, but they didn’t deal with the after effects of their war – namely the formation of these gangs. The French kings lacked the will, organization, or ability to curtail and punish these men. The English went home but were indifferent to the harm caused by the soldiers who chose to stay. In a way, it is the medieval equivalent of evacuating troops from a country after the war ends but not removing your landmines: the country is still dangerous and contaminated. All of this is really to say that thematically George RR Martin emphasizes the Flayers in a variety of ways — Second Sons, House Bolton, and so on. And, with good reason. Sometimes the emphasis in history books disproportionately skews towards the glories of the military victories of English medieval kings at the expense of describing the true impact on innocent people. George RR Martin somewhat redresses this balance (thematically) in his novels by emphasizing the Flayers and flaying. The Hundred Years’ War was a huge cash cow for some soldiers – especially the English knights and mercenaries. Some knights became so rich from booty and ransom they owned multiple estates. In fact, riches plundered from France fueled unprecedented conspicuous – a medieval keeping up with Jones – amongst the English nobility and gentry, which drove staggeringly lavish display. While fighting in France, it was all too easy for English soldiers to obtain riches. When armies didn’t pay them sufficiently, they would help themselves by robbing from the French people. After Edward III and John II (of France) signed the 1360 Treaty of Brétigny, the battered French peasants whom the English and French soldiers victimized with their chevauchées – scorched-earth raids — must have released a huge sigh of relief. Little did they know that the fear they felt would, in some cases, pale in comparison to what would happen next. These now unemployed soldiers formed freelance bands of soldiers for hire. Chroniclers often described these men as “adventurers” – but Froissart writes they were “really brigands and thieves.”2 Mercenaries came from Germany and Italy to join these companies. Because the companies were so successful, they spawned more and more child companies like some terrible alien beast. Pedro Pascal as Oberyn Martell Image: (c) HBO. Incidentally, prior to arriving for the Purple Wedding, Prince Oberyn Martell had formed a company of mercenaries. Before that, Oberyn was part of the Second Sons company3 . Although many French companies would rent their services, they also raided, pillaged, raped, burned, and ransomed their way across France in their quest for money and excitement. The free companies gravitated to the far corners of France where the local knights were either not up to or capable of fighting them off.4 They would capture castles and towns, sell them back, and ransom any wealthy inhabitants. Jerome Flynn as the sellsword Bronn Image: (c) HBO. Under the cover of night, Bacon’s men would sneak up on towns by winding their way through little-known back-country paths. At dawn, they would climb the town walls and set fire to five or six houses. The terrified townspeople would flee, leaving everything behind. Bacon’s men would then smash open the townspeople’s chests and jewelry cases and took whatever they wanted. Bacon and his men seized Comborne castle, its count, his wife and children, and even the entire town. The gang ransomed them for 24,000 écus. While waiting for payment, Bacon and his men used the castle as a base of operations. Finally, they sold the castle to the King Philip VI (of France) – and got 24,000 écus for it. Afterward, King Philip hired Bacon and his men. Bacon became his inspector at arms. In exchange, Philip and his successor, John II, kept Bacon in roan-colored chargers and palfrey horses and lots of gold and silver. To me at least, this has a light parallel with Bronn, Tyrion’s sellsword. 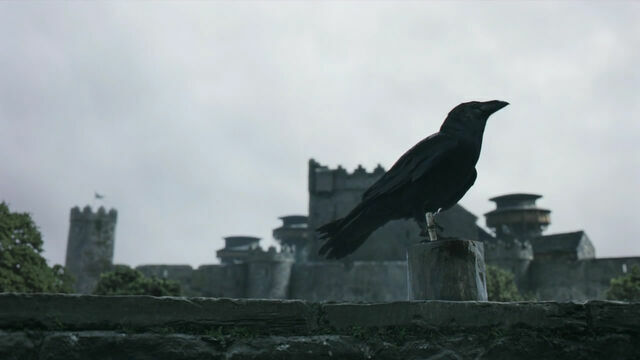 Although Bronn does not seize a castle or ransom its occupants, he does come to work for the hand of a king – Tyrion. Tyrion knights Bronn and makes him commander of the City Watch. Incidentally, Bronn is probably a great name for a sellsword. In Irish, “bronn” means award, grant, or gift. Last night, I stumbled across some information about the painting in the House Bolton/flaying article. The painting is part of a pair of paintings —a two-paneled diptych — known as The Justice of Cambyses by Gerard David (also known as The Judgment of Cambyses)). The diptych the Judgment of Cambyse — oil on oak — by Gerard David. In sixth century BC Persia, a judge named Sisamnes accepted a bribe to deliver an unjust verdict. As a result, the Persian king, Cambyses II, ordered the judge to be flayed alive as punishment for corruption. The image in the foreground depicts the king and his magistrates accusing Sisamnes, who is seated in the judge’s chair. In the mid-left background of the first painting, you can see the medieval painted equivalent of a TV “flashback”. By the doorway, a man gives Sisamnes a bribe for an unjust verdict — the event that led to his punishment. A past episode before the judgment: the bribe – the judge is in red. The second panel of the Judgment of Cambyse — the flaying of Sismanes. This portion of the second panel represents the future, what happens after the flaying. To drive home the message – and ensure its immediacy – the paintings show the participants in fifteenth-century garb, which isn’t necessarily atypical, and includes paintings of the magistrates appointed in 1496 and the coats of arms for Philip the Fair and Joanna of Castille. Such paintings are part of a larger fifteenth-century European tradition in which cities decorated chambers of justice with historical images of judgment. In addition, from the thirteenth century onward, books containing exemplary tales of justice — and cautionary tales of injustice — began to appear. Apparently, there are only a couple of punishments that are supposed to be worse than flaying: impalement and being boiled alive. Both of these punishments, incidentally, were practiced by Dracula. And, speaking of the dark prince, when I wrote the comparison between Dracula and Ramsay snow, I neglected to include an important remark by “Bored Me” – the reader whose comments inspired the post. He noted that connection between Ramsay Snow and Vlad Tepes isn’t as obvious because GRRM may have substituted flaying for impalement. As Roose Bolton once said, “Ramsay… well, Ramsay has his own way of doing things,” which if Dracula inspired Ramsay is quite literally true. The band of “adventurers” described here matches almost perfectly with the “Bloody Mummers” (aka “Brave Companions”) in “A Clash of Kings” (Book 2 in the series).